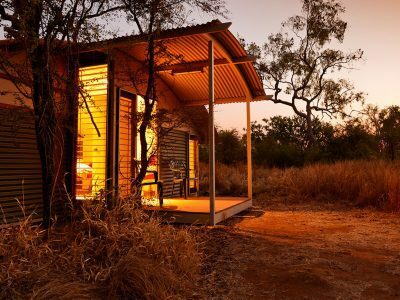 If you are self-driving into Purnululu National Park from the Great Northern Highway and visiting all the natural wonders in one day, allow yourselves to enjoy it fully with plenty of time and stay at Bungle Bungle Savannah Lodge. The 53km drive into the national park from the Great Northern Highway is via a rugged track that is only accessible to four wheel drive vehicles. On arrival at the visitor centre, pay your entry fee and turn right towards Cathedral Gorge and follow the ‘Private Camp’ signs. Approximately 11kms from the visitor centre make a right hand turn to Bungle Bungle Savannah Lodge and travel a short 1km before arriving at your destination. Fly-in packages are available with departures from Kununurra, flying in an air conditioned fixed wing aircraft with Aviair, or helicopter transfers from Warmun community on the Great Northern Highway with HeliSpirit. It’s a long drive to get to the Kimberley from anywhere in Australia. For many regular 4WD visitors it’s worth the distance but you may choose to fly instead. 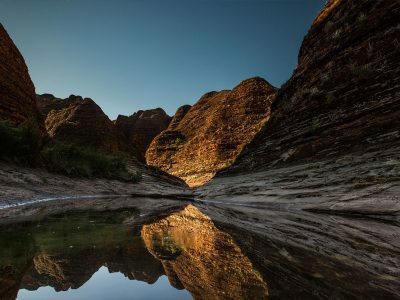 The Bungle Bungle range is located approximately 200kms south of Kununurra and 60km north east of Halls Creek by air. The range reaches 25 kilometres from north to south, 30 kilometres east to west and towers up to 600m above sea level – 250 metres above the surrounding North West plains. 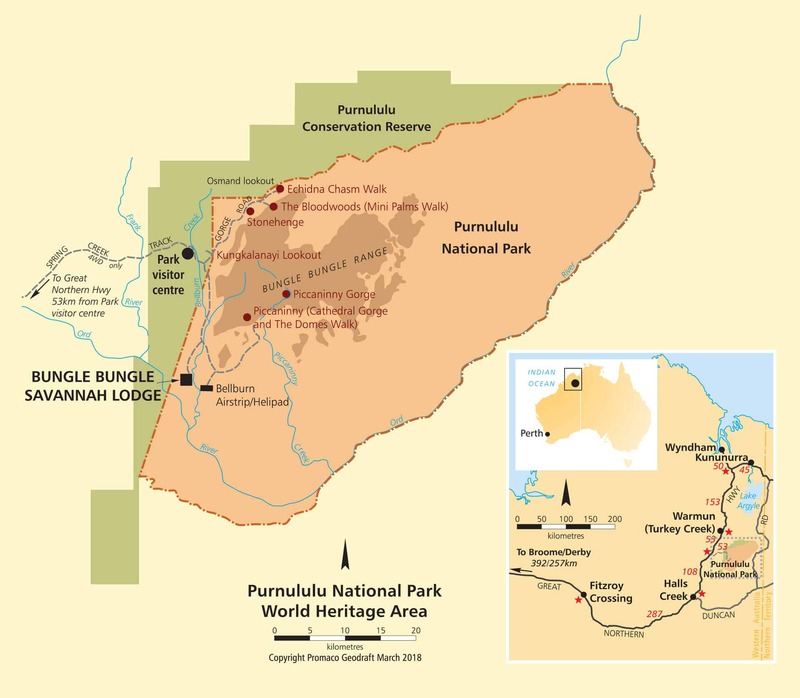 Access to the park by road is via Spring Creek Track, from the Great Northern Highway approximately 250km south of Kununurra, through Mabel Downs cattle station to the track’s end at the Purnululu National Park Visitor Centre. The track is 53 km long and is usable only in the dry season (about April 1 to December 31), and only by 4WD high clearance vehicles and off road trailers. Safely navigating it takes approximately three hours. It is a scenic drive with lots of creek crossings and winding through the ranges. 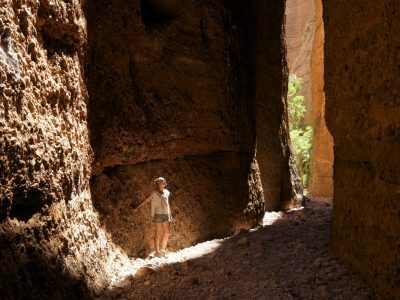 Purnululu National Park is open between April and November (weather permitting). Check with the Kununurra office of the Department of Parks and Wildlife for the current weather forecast and road conditions before entering the park. From within Australia call 08 9168 4200. Average daily maximum temperatures in the dry season (April to September) range from 29 degrees (Celsius) in July to 38 degrees in September with little rain and low humidity. Overnight, temperatures decrease to become considerably cool by early morning and sunrise. Average daily maximum temperature during the waterfall season (October to March) is 40 degrees with significant humidity. Most of the 500-700mm annual rainfall occurs between December and March resulting in unsealed roads becoming impassable and park closure.